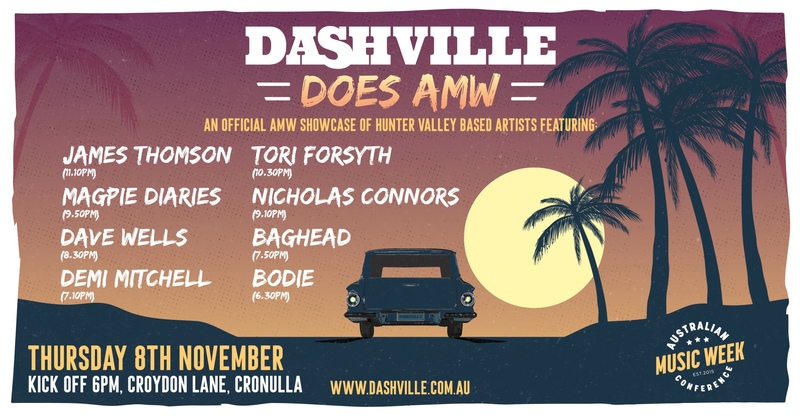 Following the success of Dashville's debut at Australian Music Week in 2017, with a showcase that featured William Crighton, Terra Lightfoot (Canada), Melody Pool and Magpie Diaries, it was a no brainer to piece together another smokin' hot line-up of outstanding talent. One of the great joys of doin' Dashville is spruiking the musicians we admire to a wider audience. We feel like you've grown to trust our tastes - and if that's so, then believe us when we say there's something very special happening in the Hunter Valley at the moment. If music is food for the soul, then please consider DASHVILLE DOES AMW the ultimate charcuterie board. Here's what's on the menu. Whether it's crooning a stirring Dylan-esque ballad or leading a full-blooded, band-backed boogie, James Thomson keeps the true spirit of classic Americana and country alive. Following two well-received solo records through Laughing Outlaw records, Thomson is getting ready to drop a brand new record towards the end of the year. Listen here. It's been a big year for Tori Forsyth - but it ain't over yet. The smouldering alt-country songstress dropped debut record Dawn of the Dark through Lost Highway Records and embarked on an epic Australian tour, which culminated in a slot at the Dashville Skyline extravaganza. Listen here. When he wasn't orchestrating four festivals at his childhood property Dashville, promoter Matt "Magpie" Johnston was hard at work on releasing his long-awaited debut record. Sanctuary is out this month and it's a radiant songbook of homespun romance and philosophy, wearing Magpie's West Coast '70s country influences proudly on its sleeve. Listen here. There’s something a little unhinged about Nicholas Connors. The way he stalks the stage with that melting gleam, slinging his axe all manic and moody, brimming with cheek and charm. When that deep resonant tone bellows forth, crooning its perverse ruminations on romance, you might think there’s a demon of mischief dwelling somewhere in the smoky apartment of Connors’ mind, drunk on Tennessee whiskey, tapping its cloven feet to Cave, Cash and The Cramps. There's a debut record in the works. Listen here. One of the bright stars of Australian music, Dave Wells has finally bestowed his self-titled debut record upon the world and it really is as magic as one could have hoped. A singer-songwriter with a mesmerising voice and knack for emotionally wrought instrumentation, Wells is someone you need to discover. Listen here. Dan Johnston, member of the Dashville family of Johnstons, is a crafter of timeless, anthemic rock music. A seasoned live performer, the man affectionately known as "Baghead" has built a formidable repertoire of powerful music that will kick around your head long after his show ends. Listen here. Demi Mitchell has received unanimous acclaim for her smoky, half-lit new record The Overflow. Best listened to by candlelight with a drink in hand, this latest collection is a dreamy, drunk slow dance of halcyon splendour. Listen here. Silky smooth purveyor of jazz-tinged soul rock, Bodie is hot chocolate for your ears. Listen here. A multi-instrumentalist and songwriter, the Newcastle native is a name of which to take note. The showcase is open to Australian Music Week attendees with a Thursday Night Live Shows pass. First in best dressed. The showcase runs from 6pm to midnight.